How fitting is it that on the very last day of the 2009 Sundance Film Festival, it finally starts to snow. It was unusually warm this year in Park City, but I'd rather have it be cold. Whenever it snows during Sundance, it really completes the experience. And it just so happened that it finally snowed on Sunday, Day 10, as I wrapped up the fest with all my good friends. The night before I spent the evening at the closing night party as well as a party at the Stanfield Gallery on Main Street. So all that was left to do was finish up on Sunday with our tradition of a final end of Sundance meal at Main Street Pizza & Noodle. First things first, I finished this Sundance having seen a total of 29 films. Unfortunately I let myself down. Both last year and the year before that (my first year here), I saw a total of 31 films. I would blame the awards this year, because I'd already seen almost all of the big winners, and all they do on Sunday is show the winners again. But in reality, it's my fault and I blame my consistent exhaustion and time management skills, but that's all a story not worth telling on here. Instead, let's get back to the good side of things. At the bottom I've included my full list of all of the 29 films I saw here at Sundance with ratings. Peter Sciretta of SlashFilm and I have established a tradition of eating at Main Street Pizza & Noodle on the final night of Sundance. This year we invited a few of our friends. We were joined by my good friend Marco Cerritos, Neil Miller of Film School Rejects, Darcy Brislin of Obsessed With Film, and Erik Davis of Cinematical. We were also joined by a few of the Derrick Comedy guys, including Mystery Team director Dan Eckman, producer Meggie McFadden, and stars Dominic Dierkes and D.C. Pierson. Suffice to say, it was an awesomely delicious meal and one of the best dinners I had while at Sundance. While at dinner, Marco asked everyone what their favorite film was and what the worst film they saw was. I have my own best and worst of Sundance article in the works right now, but to quickly answer that question just as I did at dinner, my favorite was 500 Days of Summer, without a doubt. The worst film I saw, on the other hand, is a tougher question to answer. I'd have to go with Brief Interviews with Hideous Men, which I saw just a few days ago and I thought was downright awful. Darcy said she hated Spread, which I didn't think was that bad, and both Peter and Neil said The Informers was the worst film they saw. I'm not one to interpret whether or not this year's selection of films were better than the last and so on, it's just not my thing. Sundance somewhat sets the pace for the year to come, both in terms of the films we'll see and in terms of the progression of FS.net. So what I'm taking away from it this year is that there are a handful of great films that I can't wait to see again and can't wait to start promoting once they hit theaters (or find a distributor). This is nearly the same every year, so the only differences are the films themselves, which is why it'll be yet another interesting and exciting year. I can't wait to see 500 Days of Summer hit theaters, as well as Moon, Humpday, The Killing Room, Adventureland, and Mystery Team. As I write this, I'm packing up my bags and listening to "Us" by Regina Spektor, which was the opening song in 500 Days of Summer and the perfect music to go out on. It puts me in a kind of somber mood, because I don't want to leave, I don't want to believe that yet another Sundance is over. But unfortuantely it is and it's time to move on, with a plethora of great memories still intact. Sundance is the best time of the year and whenever I'm not here, I'm already counting down the days to the next time I will be back here. It's just that phenomenal of an experience and I'm always sad to leave Park City behind again. 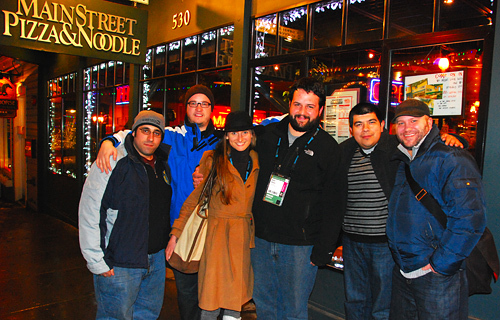 Sundance wouldn't have been as great as it was without my friends and the many people I meet every year. Not only do people like Peter and Neil and Scott make it wonderful, but I love meeting filmmakers and cinephiles. Having dinner with the Mystery Team folks was quite surreal, because we're all in awe of them and what they did with their film, yet they're in awe of us because of what we in turn wrote about their film and how we can help make it a big hit. In addition to seeing great movies for 10 days straight, it's that kind of social interaction that truly makes Sundance a one-of-a-kind experience. See you again next year! Also, a special shout out to Honest Tea for providing us with an excessive amount of delicious beverages to keep us hydrated for the entire fest. They've easily got some of the best damn bottled tea out there! I WANT TO SEE 500 DAYS OF SUMMER! 😀 You seem to be hyping it so much that I must see it ! Its gonna be forever before it comes to the theaters in Finland, argh. Seems like there was a lot of good movies. I might have to go one year. Sounds like a great film festival. Would be great to visit it one day. I'm so bummed I couldn't see 500 Days. But how come nobody is talking about The Missing Person? It was great and so unique. @2 A unique film? Impossible! =P Everyone knows that the last unique film was made years ago, and everything made recently is either a remake or sequel. So you liked 500 Days of Summer? Doesn't look like my type of film, but I might go see it just on your recommendation.